Toronto, Ontario – October 16, 2017 – RankMyAgent.com, an online platform to connect real estate professionals with the public, is proud to share as of October 11th, 2017, agent rankings and reviews are available on REALTOR.ca, Canada’s most popular real estate website. Canadian REALTORS® will have the opportunity to share their RankMyAgent.com reviews on The Canadian Real Estate Association’s (CREA) national real estate portal, REALTOR.ca. CREA is one of Canada’s largest single-industry trade associations working through some 90+ real estate boards and associations. Following successful partnerships with major brands and organizations such as RE/MAX INTEGRA, RE/MAX of Western Canada, and Lone Wolf Technologies, RankMyAgent.com is on a strong trajectory of growth and proud to work with CREA. “We are thrilled to be working with RankMyAgent.com. Providing REALTORS® with the ability to display their RankMyAgent.com reviews and ratings on REALTOR.ca helps them highlight and validate their professionalism, expertise and deep understanding of local markets.” says Mary Van Buren, Vice President of Marketing and Information Technology, The Canadian Real Estate Association. Screenshot of reviews being syndicated to REALTOR.CA using our integration. 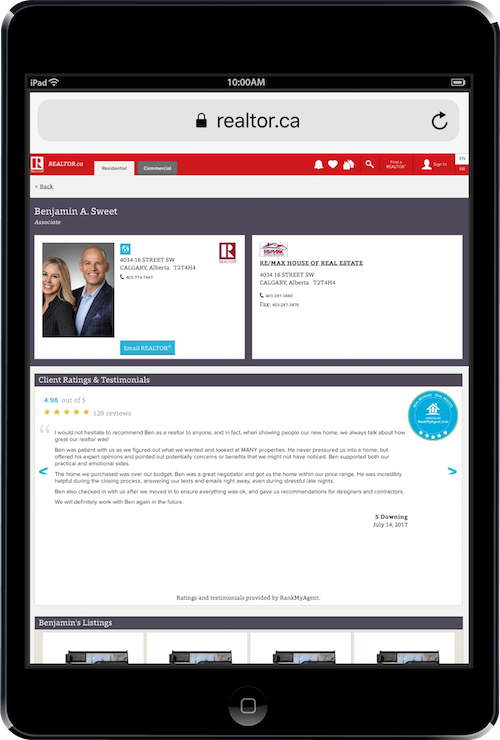 As the Canadian, industry-leading platform, RankMyAgent connects Real Estate professionals to the public using the power of verified, credible, client-generated online ratings and reviews. We deliver a moderated review management system with local geo-farming, reputation-marketing tools. Get recognized, generate new business, and build your online profile with RankMyAgent. Today, RankMyAgent.com is comprised of thousands of agents Canada wide and it’s helped consumers make the agent selection process efficient, trustworthy and successful. To learn more, please visit https://rankmyagent.com. Real Estate professionals can set-up up accounts at: https://rankmyagent.com/agent-learn-more. The Canadian Real Estate Association (CREA) is one of Canada’s largest single-industry trade associations, representing more than 120,000 REALTORS® working through some 90+ real estate boards and associations. With over 240 million visitors each year, REALTOR.ca provides listing information for residential, commercial and rental properties across Canada.